Marina is the leader of Onix Gloria cattery. Marina joined to Onix Gloria cattery in 2000. 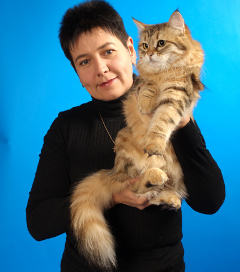 Her first cat was silver tiger female Iriska Onix Gloria. She also is the owner of Ish-Ty, Iskushenie, Witsly-Putsly and Dulsineya Onix Gloria. Marina often take part in cat shows. Her females won many prestige shows, including monobreed Siberian shows.